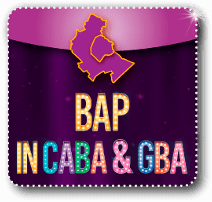 Check our performances at www.baplayers.com and choose the one that suits you the best. Contact us at contact@baplayers.com, call us on 0810-3455-BAP (227) / 011-5246-6017 or via WhatsApp at 11-3477-5206. Once the reservation is confirmed you will receive an e-mail confirmation. Please check you have received it to make sure your reservation is effective. You will have up to one week before the show to reconfirm the number of seats. Once you book your tickets you will have up till one week before the performance to confirm the number of seats. You will be charged a minimum equivalent to 85% of the seats you have booked. You can avoid this minimum charge by reconfirming the number of seats up to one week before the show you are attending, without exceptions. Collect the money for the tickets well in advance. Ticket booth is opened 30 minutes before the show. Extra teachers pay half Price. We suggest arriving between 15 and 25 minutes before starting time. A maximum tolerance of 10 minutes may be granted. Groups will be strictly seated by order of arrival. From 45 to 1 hour, depending on the play.